This article is about the character. For the mission by the same name, see The Rampaging Octowhirl!. 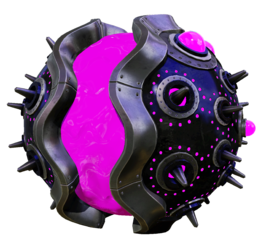 The Rampaging Octowhirl is a one of the many Great Octoweapons battled in Octo Valley. The Octowhirl was an Octoweapon created during The Great Turf War by the Octarians. When everything seemed to be in favor for the Octarians, a plug was pulled and caused the Octowhirl and the rest of the Octarian machines to loose power. Nearly 100 years later the Octowhirl was unleased once again by the power of the Zapfish in order to attack once again. The Octowhirl is a giant round clam-like Octoweapon with several spikes and an antenna. It has Octarian eyes that can switch from white or purple. It's "mouth" is also filled with ink and is where the tentacle is located. The Octowhirl trying to attack Agent 3. When Agent 3 arrives to its Kettle in Sector 3, a Zapfish is granted to the Octowhirl. It will then attempt to spin right into 3 but is stopped when they spray a huge puddle of ink. Octowhirl's tentacle is then able to be Splattered. Each time a tentacle is splatterized, it will then make a scream strong enough to cause some of the panels on the floor to spin. After its tentacle has been splatted three times, Octowhirl will be defeated and inksplodes. The Octowhirl is based on a mixture of a giant clam and a spinning top or dreidel. For reasons unknown, the Octowhirl was not included in The Art of Splatoon. Submerging the Octowhirl in ink is done in a similar way to Octoballs, the only difference being the amount of ink needed. Their is a glitch where the Octowhirl's tentacle will remain outside of its shell. This page was last edited on 13 March 2019, at 04:21.